When the Grand Prix teams gathered at Spa the Lancia team was missing. Alberto Ascari had been killed on May 26 while testing a Ferrari sportscar at Monza but in addition the Lancia company had run into financial trouble and had been sold. The new owner was not interested in Grand Prix racing. 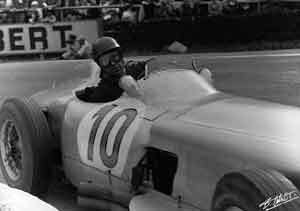 Eugenio Castelotti managed to persuade the company to let him race a D50 in Belgium and he impressed everyone by setting the fastest time in qualifying ahead of Juan-Manuel Fangio and Stirling Moss in the their Mercedes-Benz W196s. Behind them Giuseppe Farina's Ferrari shared the second row with Jean Behra's Maserati 250F. In the race Fangio took the lead at the start and Moss was up to second soon afterwards and the pair drove away from the remainder of the field, while Karl Kling (in the third Mercedes) battled for fourth position with Farina, Behra and Belgian racer Paul Frere in a Ferrari. Behra soon crashed heavily but was unhurt and later took over Roberto Mieres's car. At half distance Castellotti disappeared with gearbox failure and so Farina moved up to third place. The race order remained the same all the way to the finish.